AAMT uses various types of technical equipment to complete the research objectives identified to support WDNR Aquatics. The following are descriptions of the AAMT “research toolbox” which are the predominate research tools used on state owned aquatic lands. 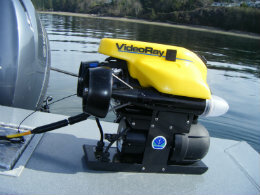 AAMT uses a single beam sonar mounted to a boat to conduct research throughout Washington waters. Sonar uses hydroacoustics (sound in water) to decipher details about the seafloor. For a given research site, sonar emits a pulse of sound through the water column, the sound travels to the seafloor and the echo bounces back to the sonar equipment. The equipment is able to measure the time it takes for the echo of the sound emitted to return from the seafloor to the hydroacoustic equipment (transducer). From this process, the single beam sonar is able to detect the depth of a water body (bathymetry) and distinguish differences in that seafloor. This allows AAMT to determine underwater plant growth, changes in bathymetry, and the presence of underwater structures or obtrusions. DNR Aquatics uses single beam sonar for research related to resource management activities on state owned aquatic lands. There are multiple steps in the process to obtain quality data at each research site. First, a location is selected; a survey area is defined; and transects are created and mapped prior to going to the site. 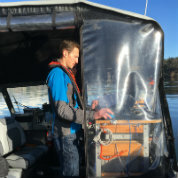 Once at the site, the boat drives the predetermined transects in the defined area, at a particular speed, and collects sonar data, which is georeferenced. The data is then brought back to the office, processed, interpreted, and mapped. Visit the publications website to read more about the multi-beam sonar equipment and the protocols used by AAMT. 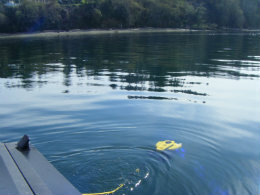 Typically sonar is one of multiple parameters used at a research site. 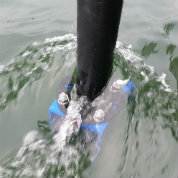 It is common for other research such as sediment sampling, plant counts, underwater video, etc. to be completed and evaluated along with the sonar results. Those needs are determined by AAMT prior to data collection. 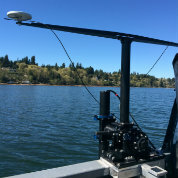 AAMT recently started using a multi-beam sonar mounted to a boat to conduct research throughout Washington waters. This works similarly to the single beam sonar. The main difference is that the multi-beam emits sound into the water column in a way that covers a larger area. This allows the multi-beam to provide 100% coverage of the seafloor, which allows AAMT to map the seafloor with greater accuracy. This image is an example of the seafloor mapping capabilities using the multi beam sonar. It shows depth in meters for Pitt Passage in southern Puget Sound. The multi beam allows AAMT scientists to map the entire seafloor, offering an improved method to see, evaluate, and manage aquatic state resources. 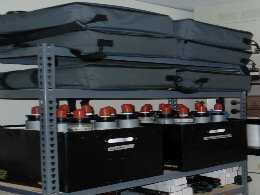 The AAMT carbonate lab was established to build up DNR capacity in ocean acidification science. AAMT maintains more than one hundred sensors in Washington waters to measure pH, chlorophyll, dissolved oxygen, salinity, and temperature. These sensors are calibrated, cleaned, and built in the carbonate lab. To gain a better understanding of ocean acidification dynamics in the field, AAMT scientists often collect water samples. Back in the carbonate lab, the pH and total alkalinity of these samples can be measured on the benchtop, following best practices. 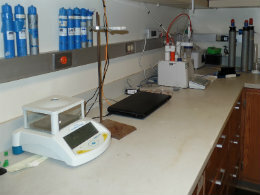 The carbonate lab is also used to identify and measure invertebrates, plants, and to analyze sediment samples.